Diagonal lines fire across this elongated, asymmetrical shawl, creating striking contrasts in angles and colors. 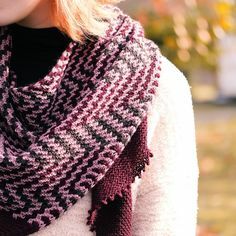 Textural stripes are worked using simple knit and purl stitches, while the intersecting columns are created by slipping stitches at regular intervals; only one color is ever worked at a time. The sample pairs a neutral main color with a long, self-striping yarn as the contrast color, but using a variegated yarn or leftovers to create your own custom stripe colors as the contrast would be equally lovely. The long, bias shape shows off the dramatic pattern while being easy to wear, and the simple construction adapts to varying amounts of yardage. Techniques & Skills Used: knit/purl, increasing/decreasing, slipped stitches; this pattern is both written and charted. Size: 92” on longest side and 18” deep at point; see schematic. Yarn: Madelinetosh Tosh Merino Light (100% merino wool; 420 yards/100g); 1 skein MC; Crystal Palace Yarns Mini Mochi (80% merino wool, 20% nylon; 195 yards/50g); 2 skeins CC. Shown in Natural (MC) and 120 Fireworks (CC), and using about 420 and 350 yards respectively. This pattern may be adapted to any amount of yarn in two colors; see Designer’s Notes. Gauge: 24 st and 38 rows/4” in Body stitch pattern, after gentle blocking. Gauge is not critical for this project, however a different gauge may result in a smaller or larger finished shawl, and different yardage requirements. Tutorial: how much yarn for the bind-off row? 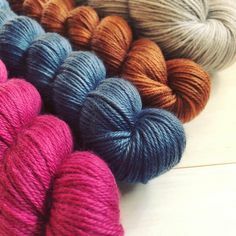 New Yarn . . .